I am physically back in Boston (from Peru indeed, very good guess!) and still need time to be really entirely present so that I can get back into cooking, visiting your blogs and writing the stories about my trip. No need to say that I cannot wait as I have so many pictures I want to share! Be ready! While mon atterrissage (my landing) slowly happens — tout arrive à qui sait attendre, non ? (all comes to the one who knows to wait, right?) — why not talk about a dessert prepared a few weeks ago. I am glad that I actually had the smart idea to write down the recipe before taking off otherwise for sure, I would have forgotten in view of how tired P. and I both felt after a long ride home — and I will spare you with the details of our misadventure back. Even my English seems to have suffered — as P. sometimes points out — since for two entire weeks, I have had my head squeezed between Spanish, French and English. A mess, I tell you! A line of deliciousness, I promise. They look like little soldiers well-aligned and ready to march on! I reckon I must have just a tiny bit too much imagination. The never-ending dance of tarts continues with me, you will have to excuse me, but I just cannot help it. I always have ideas for tarts. This time however, my theme is le bleu for a change, B like blackberry and B like blue. Do you remember picking blackberries? Oh you people living in Washington State, how lucky you are indeed! While I visited Seattle in early September, I managed to see wild blackberries everywhere, even where they are not usually to be expected, in odd places in the city where any patch of green grass can be found. This reminded me of home. This reminded P. of Ireland. I have fond memories of picking these delicious wild fruit and simply cannot decide what I like best: picking them so that I can gulp them down quickly, making a mess while staining my hands and face, or walk around with a little bucket which I eventually fill up if I am good, imagining the many possible ways to prepare them. You will have guessed that I did not pick those blackberries. I have always been fond des mûres. I like to compare these delicious round fruit to miniature juicy pockets which burst open in your mouth when squeezed between the teeth, like an air-balloon bursting. Impossible de résister ! 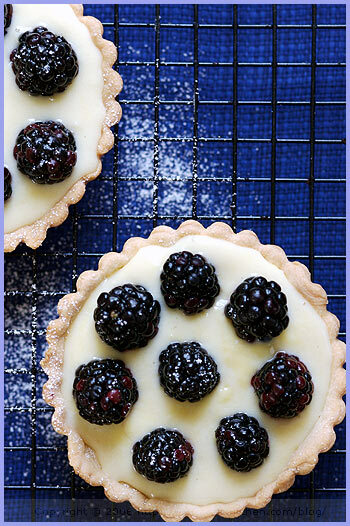 I often have leftovers of pâte brisée (unsweetened pie crust) that finds a home in simple desserts like these blackberry lemony tarts. It could be argued that the taste of such dessert would be enhanced if instead of using an unsweetened pie crust, I used a sweet pâte. To be honest, I have always liked pâte brisée in sweet tarts because I believe that it allows for less sweet desserts, perhaps more rustic in my eyes. Because I am known to never resist lemon in a dessert, I decided to play with the idea of making a lemon cream instead of perhaps a more classical crème pâtissière (custard) or a chantilly (whipped cream). I made a batch of cream for about four tartlets and since I had a tiny more available, I also made a few finger-food mignardises, so easy to eat and satisfying on top — instead of eating the cream by the spoon, which I ended up doing anyway. Grate the lemon zest very finely. Mix it with the milk and heat the two until the milk comes to almost a boiling point. Stop immediately. In a bowl (use a stand mixer if you have one), beat together the sugar with the egg yolks. Add the lemon juice and without stopping to stir, pour slowly the hot milk. Place the cream in a bowl over a pot of simmering water and as you keep stirring, let it become thicker. It cook take up to 10 mns until you reach the ideal consistency (it will thicken with the gelatin too). Soak the gelatin sheet in cold water for a few mns and squeeze out the excess water. Add it the the hot cream and mix until it is dissolved. Transfer the lemon cream in a bowl placed in a container full of iced water (add ice cubes to make the water bath cooler). Mix from time to time and cover with a plastic wrap. Place in the fridge for a few hours before using. Roll your dough thinly and place it in small tart molds. Make little holes with a fork and place the molds in the fridge for 30 mns. Preheat your oven at 350F and cover the dough with parchment paper or foil paper on which you put dry rice or a weigh. 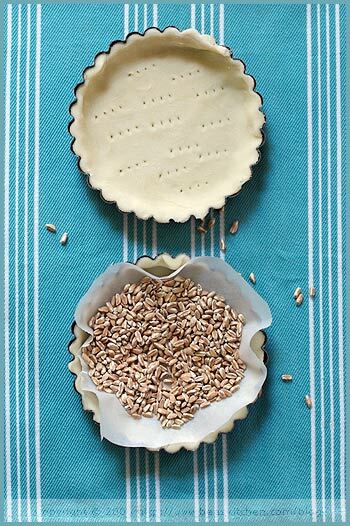 Cook your tart shells for 15 to 20 mns. Remove the paper and continue to cook for 2 mns. Remove the tart shells from the oven and let them cool down on a cooling rack. 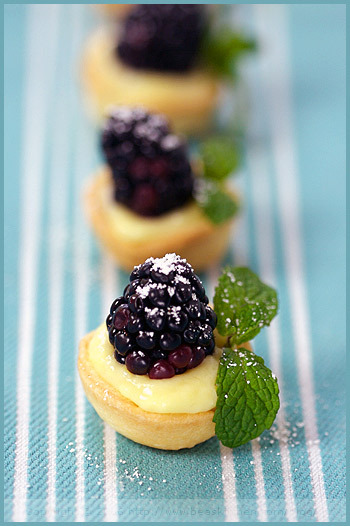 Garnish the shells with lemon cream and fresh blackberries. Sprinkle with confectioner’s sugar and decorate with mint. If you have leftovers, make smaller tarts, for finger food. Rapez très finement le zeste de citron. Mélangez-le au lait et faites chauffer jusqu’au premier frémissement. Arrêtez tout de suite. Dans un bol, mélangez le sucre avec les jaunes d’oeuf (utilisez un mixeur électrique si vous en avez un). Ajoutez le jus de citron et sans cesser de remuer, versez doucement le lait chaud. Faites tremper la gélatine dans de l’eau froide pendant quelques minutes et essorez-la bien. Ajoutez-la à la crème chaude et remuez pour qu’elle se dissolve. Transférez la crème dans un bol placé dans un plat contenant de l’eau glacée (ajoutez des glaçons si nécessaire). Remuez de temps à autre. Couvrez d’un film alimentaire et laissez refroidir au frigidaire pendant quelques heures avant utilisation. Étalez votre pâte et garnissez-en des petits moules ronds. Piquez la pâte avec une fourchette et mettez les moules au frigidaire pendant 30 mns. Préchauffez votre four à 180 C et faites cuire les fonds de tarte à blanc pendant 15 à 20 mns (avec un poids tel des grains de riz sec posés sur une feuille de papier aluminium). Retirez le papier et poursuivez la cuisson pendant 2 mns. Sortez les fonds de tarte du four et laissez-les refroidir sur une grille. Garnissez vos fonds de tarte avec la crème au citron et les mûres fraîches. Saupoudrez de sucre glace et décorez avec une feuille de menthe. Faites des mignardises si vous avez encore de la pâte et de la crème. Ces tartelettes sont magnifiques…et les minis, rien à dire, j’en ferai une bouchée! 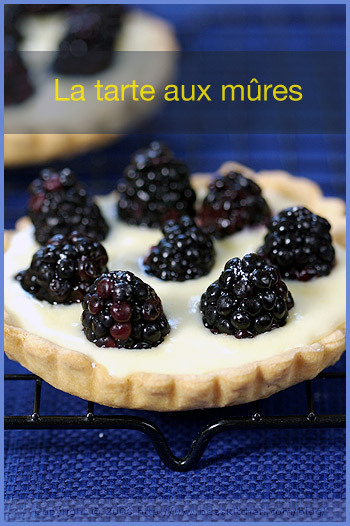 Les photos sont sublimes et la recette, simple et en toute légéreté est véritablement une invitation à la gourmandise! Cet été j’ai mis une recette de tarte aux mûres et crème citron, la seule différence est que je ne mets pas de gélatine ni de lait mais un peu de beurre et c’est vrai que c’est un régal. J’opte pour la version individuelle, trop mimi!! De très jolis tartelettes, maim!! classique chez Pierre Hermé: normal, ce monsieur sait ce qui est bon (lol) et en plus c’est si beau!! Welcome back! It sounds like it was an amazing trip… can’t wait to see the photos and hear the stories. These look yummy and what beautiful pictures. Oh my God. I´m addicted to this blog and to your Flickr!!!! Can´t wait for trying some of these recipes. You´re great!!! Thanks for sharing these wonderful recipes and nice photos!! Ooh what delicious little things you have made. I might have to try some of these, just saw some blackberries in the stores recently. It’s not often that we find them here too. Yummmmm! I just can’t wait for blackberry season to roll around again! Now, to stop salivating!!!!! Si tu me prends par les sentiments: les mure et le citron, alors la je craque! Je me souviens de ramasser le mures et les framboises sur le bord de la route quand j’etais petite pour voir ma maman en faire des confitures. Un regal! Welcome Back, Bea! Can’t wait to hear all about your adventures. 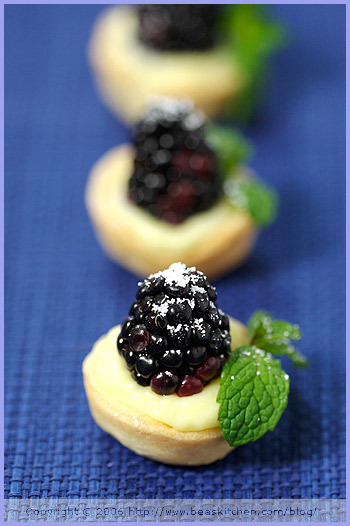 These mini tarts are so cute and sound wonderful! 2. I’ve never seen gelatin in sheets, only powdered gelatin. Any suggestions? Bea, c’est tellement beau. On n’ose pas penser que çà doit être meilleur. Lined up all in a row would make them sound like they were just waiting for me to gobble them up one by one. Welcome home Bea. Your photos are as brillant as ever! Peru – there must be some great stories and some about wonderful food. Wow. Just found your site. Great photos and writing: glad to have found you! 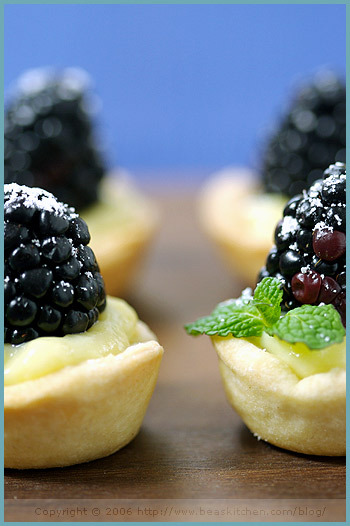 I cannot resist a tart, and Bea these look just perfect! I am the same, any dessert with lemon is one I am happy to sink my teeth into. Qu’est-ce que tu me fais envie, avec tes photos, avec tes mots! Dommage que la saison des mures soit deja passee, j’irais en cueillir immediatement sinon. A bientot pour de nouvelles aventures donc! pretty soldiers in fact bea! and welcome back again! That’s “Good things come to those who wait.” And welcome back. I love the little ones…so cute I want to eat them all! i think you should open your own shop in boston =) your creativity and imagination always produce the most beautiful, dainty desserts. All around greatness! Good flavor combos and even better is the color contrast! I have my mouth wide open so they can march in! They look so pretty and I love the way you used the blue tile as a backdrop! Perfect. Just when I think you can’t possibly out-do yourself, you do! Fabulous photos! oh aren’t they adorable!!! 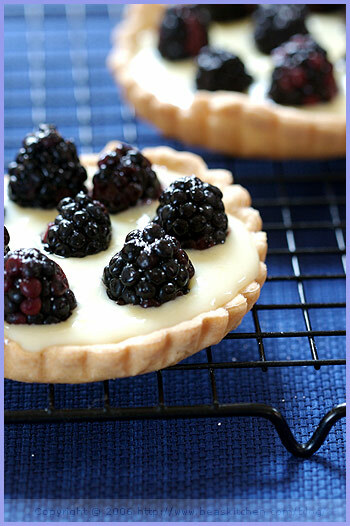 Your tart mould must be very tiny (the one only fits a single berry), I never able to resist anything like this! Bea, I also think lemon-y cream just perfect for this dessert. trop belles ces tartes qui rappellent la fin de l’été! Plus de mûres ici en ce moment! Moi aussi je cours après le temps et une si belle tarte me redonne du tonus pour poursuivre ma course contre le temps ! Merci Noémie. Contente de lire que ca te plait. Choupette, je dois aller voir. C’est dans tes archives? Sylvie, ah ah, on en mange plus finalement! Avital, tu le connais bien mieux que moi. Je n’y vais pas souvent et n’ai qu’un ancien de ces livres! Skat, yes there will be tons of pics, so be prepared! Ligia, thanks for your nice note! I am glad you are enjoying it! Stop by again! Ilingc, thank you. It feels nice to be back. Elaine, yes we are entering a new fruit season now! Helen, ah oui, moi aussi j’ai les mêmes souvenirs! Comme c’était bien! Kat, thanks my dear. I am ready to tell you the story soon! Dave, you saw my email! Carol, thanks. I bet you would wolf them down, even if they are far from being Hermé’s. Claude, ahah, cela t’intrigue cela pas vrai? 😉 Je peux te montrer, c’est facile! Tanna, thanks once more my dear. I am happy to be back amongst you all again. Janelle, thanks for stopping by. Your site is lovely btw! Jenjen, I can guess you do not resist tarts. I see so many goodies on your blog. Gracianne, oui oui, le récit arrive bientôt. Ben, ahah, you are my English dictionary. Ellie,ah nice. I cannot wait to hear about it. Jeff, cute eh, and so small! Jen, ahah, thank you. Sweet of you to say so. Let me think about this. A lot of work! Eliza, ah lucky you. Enjoy it. I loved it when I was there. Lilo, ah mais oui, tout est possible. Peabody, happy you like the combo. Sher, ahah. Thank you! Glad you like them. Catherine, thanks a lot for your compliment! Really appreciated. Gattina, yes these molds for the mini ones are tiny. I like tiny finger food. Mercotte, ah oui, c’est bien dommage que ces fruits ne soient plus de saison. Fabienne, ahahh, tant mieux et merci! Welcome back, Béa! These little sweets make me so happy to see you back from your trip. I hope you recover quickly! sweet, they look adorable, I love lemon desserts too! Easily the best food blog on the net right now.. love your work!